This pizza rocks. 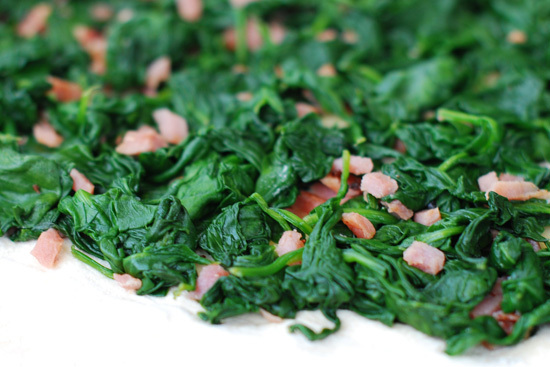 Ham gives the spinach a zing that balances the chicken’s tender flavor without overwhelming it. The mix of Swiss cheese against the crust and aged mozzarella lightly baked on the surface strikes just the right note. And by making use of a double bake – once to set the crust and heat the spinach base, the other to reheat the precooked chicken – the whole thing comes together perfectly. 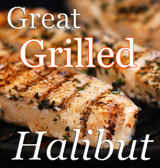 So here you go, a fresh take on flavor for a fabulous Spring! Wilt the spinach: Wash and drain the spinach. Chop the ham into ¼” dice. Set a 12” non-stick frying pan over medium heat and add 1Tablespoon of olive oil. Sauté the ham for 3 minutes and then add the spinach (in 2 lots, if necessary). After a minute, turn the spinach over all the way and sauté the other side for a minute or two. The spinach should be mostly wilted but still bright green. Remove to a bowl. Once cooled somewhat, squeeze the spinach leaves by handfuls to remove most of the liquid. Discard the liquid and separate the leaves. Prepare the chicken: You can use roasted chicken breast, prepared strips such as those available at Trader Joe’s, or you can fry a boneless breast. If you cook chicken specifically for this pizza, undercook it slightly for best results. Slice the chicken into strips ¼” thick, toss with 1 Tablespoon of olive oil and sprinkle with salt and pepper to taste. Make the pizza: Spread dough out on a floured counter to make a 12” round. Move to a wooden peel that has cornmeal on it and make sure the pizza blank ‘slips’. Put slices of Swiss cheese on the dough and sprinkle the spinach/ham mixture all over the pizza, leaving a margin at the edge. 1st Bake: Set a pizza stone on the center rack of a conventional oven and preheat it to 475°. If you have a woodfired oven, burn a fire for 2 hours until the ash turns white on the sides of the oven; move the fire to the back and sweep the floor clean. Slip the pizza directly onto the pizza stone or the floor of the WFO and bake it for 3 or 4 minutes until the crust becomes puffy and the spinach is steaming. 2nd Bake: Pull the pizza back out of the oven and quickly top with chicken strips and mozzarella. Sprinkle with oregano and send the pizza back into the oven. Bake for 3 or 4 more minutes until the mozzarella is just beginning to brown. Remove, let cool for a few minutes, and dig in. Springtime on a pizza. Spinach and ham mix ready to get to work. Sound amazing Don! Looks like the oven is already getting plenty of use! My mouth is simply watering! Hubby loves buffalo sauce mixed in with blue cheese dressing with chicken tossed in for his pizza. He has resisted firing up the wood oven during these cold temps (we hit a high of 50 today in UT) for fear of cracking the dome. When’s a good temp to fire it up? Gorgeous I love florentine pizza, and the lighter version of yours looks delicious! This looks great! I love the spinach. For your foundation, you could use a pesto, or a béchamel sauce. This pizza looks amazing. So delicious. Wow, this looks so so good! Wish it was my dinner for tonight, but it will be dinner someday soon! Now this is a pizza that could count as a vegetable! 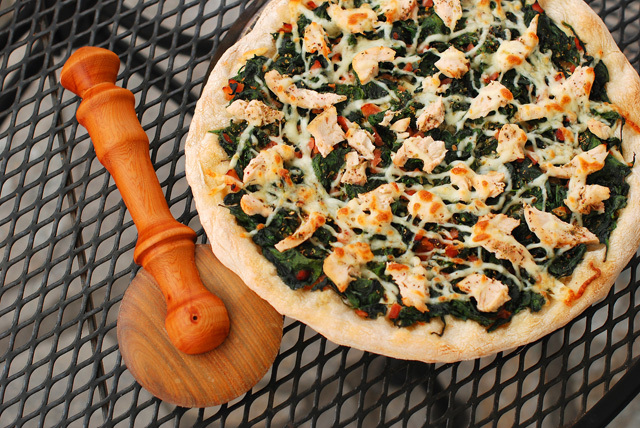 I love the idea of chicken florentine on a pizza. 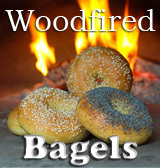 I’ll definitely have to try this one even though I don’t have access to a wood fired oven. Thanks for sharing.